Bikes are available for rent at the 24-hour reception, and Lake Balaton offers over 200 km of cycling routes. Children's Playground and BBQ Facilities. All families with small and big children are most welcome to Partvilla at Balatonboglár. Our hotels comfort and the beautiful surrounding with the Lake Balaton will grant for all the members of the family an excellent chance for a rest. Both the little and the big ones can enjoy the gradually deepening water of the southern shore on our fully developed private beach. If you want to make yourself comfortable on the beautiful green grass of the shore, or on our sunbeds underneath the bright sun or in the shadow of a tree or a sunshade, or even in the hotels Beach Bar- our generous garden offers for all age group calm and rest. babysitter service available on request. For the active holidays, we are offering for the young and youthful the possibility to play volleyball, table tennis, shuttlecock and do watersports. On colder days, use our external Finnish sauna, located directly at the shore and offering a wonderful view of Lake Balaton. We are glad to offer you our massage service, for which you can book a time in advance at the reception. Safeguarded private parking is available free of charge for our guests in the hotel garden. Should you wish to do sports or to hike, you can rent our well-equipped bikes to bike around the environs or the entire Lake Balaton on its 126.8 miles long bikeway. You can carry infants in seats and for the older children you can rent children’s bikes (in limited numbers, please inquire at the reception desk before renting). The hotel is located close to the Port of Balatonboglár, offering numerous pleasure cruising, sailing and ferrying opportunities to make excursions along the entire length of the shores of Lake Balaton. Should you need help in organization, please do not hesitate to contact us. For our especially sporty guests there is possibility to visit the Tennis Club, which you can reach in 5 minutes from the hotel. The lovers of gastronomy should visit the neighboring famous wineries. These wine cellars offer the noble wines and champagnes of the Balaton Uplands, and during visits to vineyards, parcels and cellars, an introduction is given to the history and technology of wine-making around Lake Balaton. 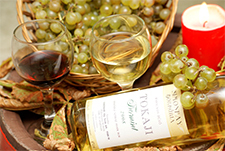 There are numerous wineries on Kishegy Hill, located in the vicinity Partvilla, including the Konyári cellar and wine-press house, the Katona wine house, the Ikon wine-vault, the Garamvári vineyard etc. The Adventure Park and Bobsled Track of Balatonboglár, which is open the entire year, offers an appropriate program for every age-group. In addition to the bobsled track and the cableway, you can climb walls or try archery, while the smallest children use the playground and the springboard. If you visit Balatonboglár, don’t forget to visit the Globe Lookout Tower offering a magnificent view of Lake Balaton. Várdomb, the hill on which the lookout tower was built, is an excellent scenery for picnics. If your family is seeking active recreation during your holidays, Balatonboglár can offer you diverse opportunities. Whether a bike tour, a walk in the romantic forest or a picturesque pleasure cruising, you can select from among numerous alternatives according to your liking.